One thing was clear when Geoff Johns announced his departure from the Green Lantern line - whoever followed him would have big shoes to fill Thankfully, Robert Venditti does not try to match Johns in tone nor does he attempt to top Johns' latest universe-shaking crisis with an an even larger universe-shaking crisis. 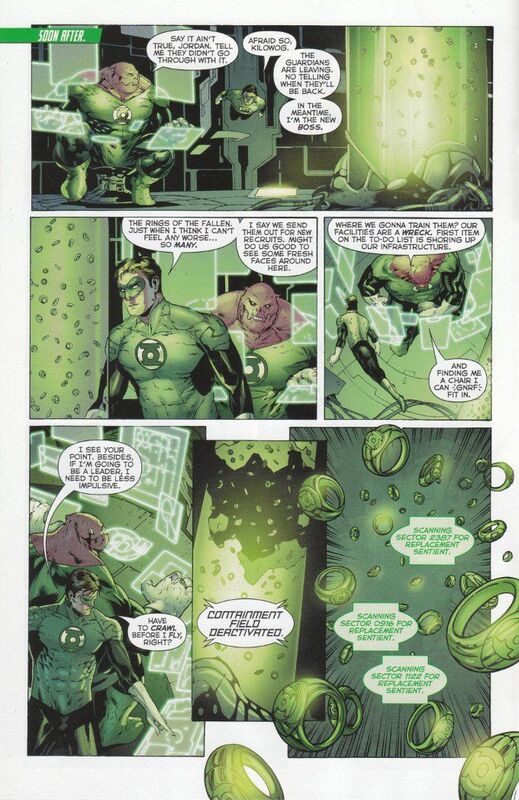 Instead, Venditti focuses on Hal Jordan the man and how his life and his Corps have changed in the aftermath of the Wrath of the First Lantern. Venditti offers a lot of good character moments throughout the issue as the new status quo is established. 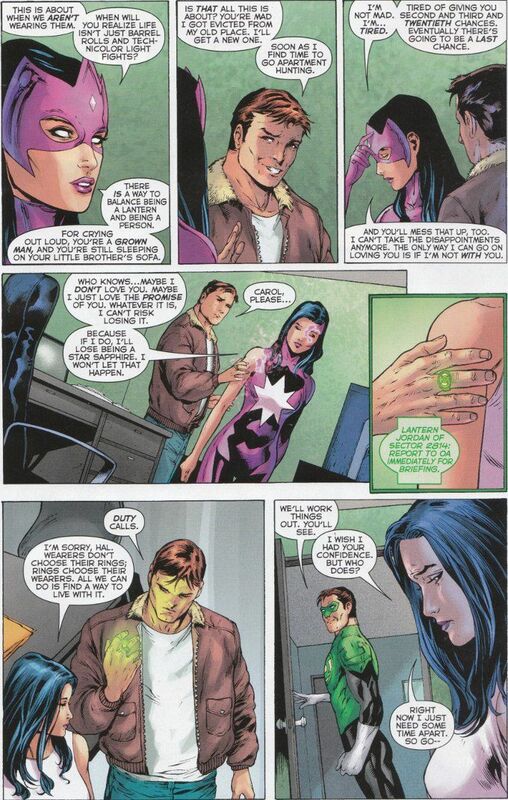 My favorite involves Carol Ferris, who basically admits that her Star Sapphire ring is being powered by codependency and her refusal to give up that power while simultaneously refusing to let herself be taken advantage of by Hal Jordan yet again. This is a neat twist, given the Happily Ever After ending Johns gave them in his last issue. And I can't help but wonder if Hal's frustration at being handed the responsibility of running the entire Green Lantern Corps in some way mirrors Venditti's own feelings about taking over Green Lantern in the wake of Geoff Johns' departure. In any event, this book also promises a greater connection between this and the other Green Lantern family of titles, as we see scenes that seem to hint at what is to come in both Green Lantern Corps and New Guardians. Billy Tan and Richard Friend prove equally capable on this issue's art duties. Tan has a good eye for detail and the ability to fit a good deal of intricacy into a single small panel. Friend has a light touch, leaving Tan's pencils lightly inked for the most part - the better to highlight the details without obscuring them in shadow. All in all, this new Green Lantern is a different kind of book that what we've seen of late. Different, yes but quite enjoyable in spite of it. I will admit to some concern that I may soon be required to read all of the Green Lantern titles in order to understand what is happening in just one. Time will tell that tale but for now, if you're a science-fiction fan or have been curious about Green Lantern as a character, now is the time to give this title a try.